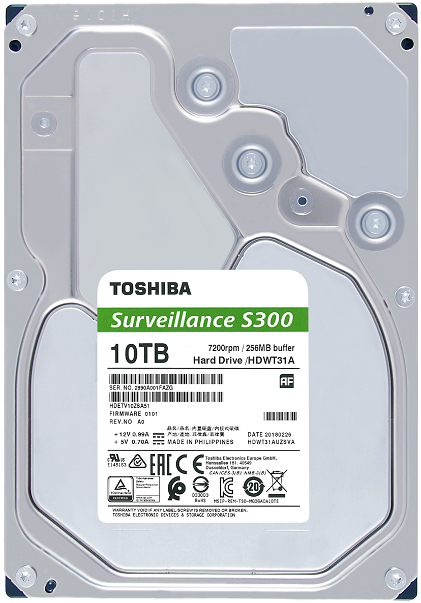 Toshiba introduced two new families of retail 3.5-inch hard drives designed for surveillance and video streaming applications. The S300 lineup will offer high performance and up to 10 TB capacity, whereas the V300 is focused on energy efficiency and quiet operation with capacities of up to 3 TB. Both families of HDDs will be available in retail starting this month. The Toshiba S300 series of hard drives includes models featuring 4 TB, 5 TB, 6 TB, 8 TB and 10 TB capacities. The latter three products belong to the MD06ACA-V lineup introduced in October, the former two probably rely on a different platform, but support the same feature set. The 6 TB, 8 TB and 10 TB drives feature a 7200 RPM spindle speed, a 256 MB cache buffer, and a SATA 6 Gbps interface. All of the Toshiba S300 series HDDs support ATA streaming technology, and with their intended market in mind, can record data from up to 64 HD cameras at once, quickly wake up from idle and resume work, etc. 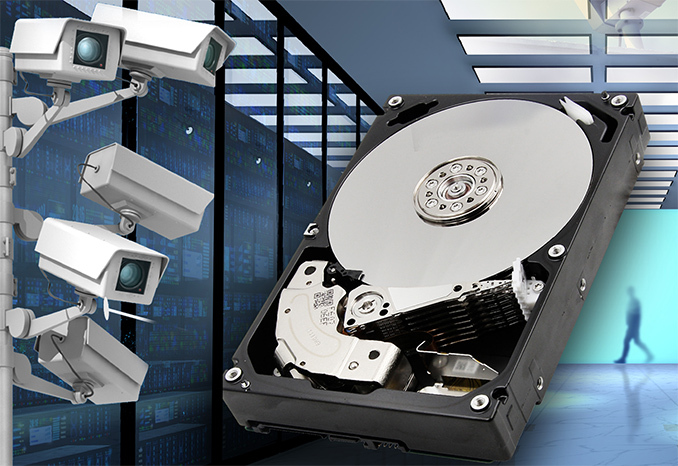 These drives are prepared to work in vibrating multi-drive environments of video surveillance applications (SDVR, SNVR, Hybrid SDVR) and therefore support a number of specific enhancements, including top and bottom attached motors, RVFF sensors, second-generation dual-stage actuators. As for endurance, the S300 series are rated for 180 TB per year and one million hours MTBF. When it comes to performance, the top-of-the-range S300 10 TB supports up to 248 MB/s media to buffer transfer speeds due to its very high areal density (it is based on seven 1.42 TB 3.5-inch platters). Other HDDs in the series use fewer platters with a lower areal density and therefore their performance is slightly lower as well. As for power consumption of the S300-series HDDs, it varies between 7.88 W and 9.48 W (operating power), depending on the model. Moving on to the Toshiba V300 family of hard drives. These HDDs are entry-level consumer drives aimed at video streaming applications and featuring a 5000 RPM-class spindle speed and up to 64 MB buffers. The V300 HDDs can quickly resume work from sleep, they support the ATA streaming technology, and they can record data from up to four HD cameras at once. These drives are based on 1 TB platters, so expect their performance to be in line with similar products from Toshiba released earlier. As for power consumption, it varies between 4.2 W and 5.7 W, depending on the SKU. Toshiba stresses that the V300 series HDDs are mostly aimed at consumers who want inexpensive 3.5-inch HDDs for their HTPCs and similar applications. They can also be used for various home security applications, provided that four cameras are enough. 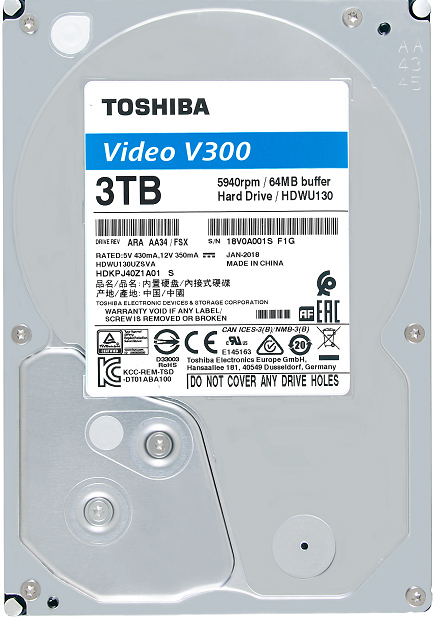 Toshiba will begin shipments of its S300 and V300 HDDs this month, the company said. The V300 series will be officially priced between $49.99 and $89.99, whereas the S300 drives carry MSRPs between $119.99 and $349.99. Bear in mind that recommended prices tend to be higher than the retail prices, so don't be surprised if the new hard drives end up with lower, more competitive street prices. Consider yourself lucky that you got a full refund of the purchase price. The standard industry practice seems to be sending you a refub drive, even if your drive fails on first use.